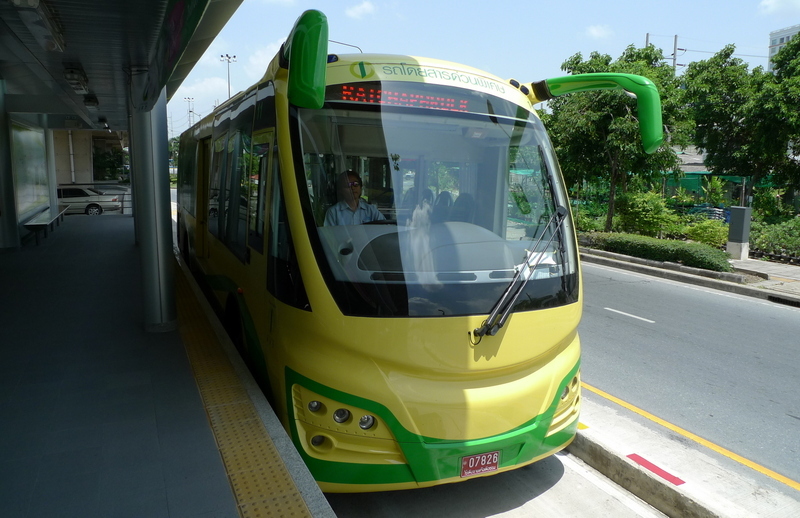 Months after I thought the project was fatally stalled, Bangkok’s new Bus Rapid Transit scheme started running this past week. Finally, the City of Angels is making some more progress away from private automobiles and towards public transit. The concept of Bus Rapid Transit, or BRT, is somewhat akin to having a light rail system but substituting busses for the rail cars. This way, you don’t have the significant infrastructure investment while still enjoying many of the benefits of light rail transit. Cities as varied as Jakarta, São Paulo, Bogotá, Seattle, and Brisbane use various BRT systems to good effect. This first route (four more are planned in the years to come) is shown in green at the bottom of the map. It begins near the Chong Nonsi BTS Skytrain station on Narathiwat Road between Silom and Sathorn Roads, running southeast along Narathiwat Road and then turning onto Rama III Road and heading west along the south side of the city, terminating on the Thonburi side of the river near the future Ratchadapisek BTS station on the western extension of the Silom Skytrain line. Prolific blogger Richard Barrow has created a Google map showing the whole thing in detail. 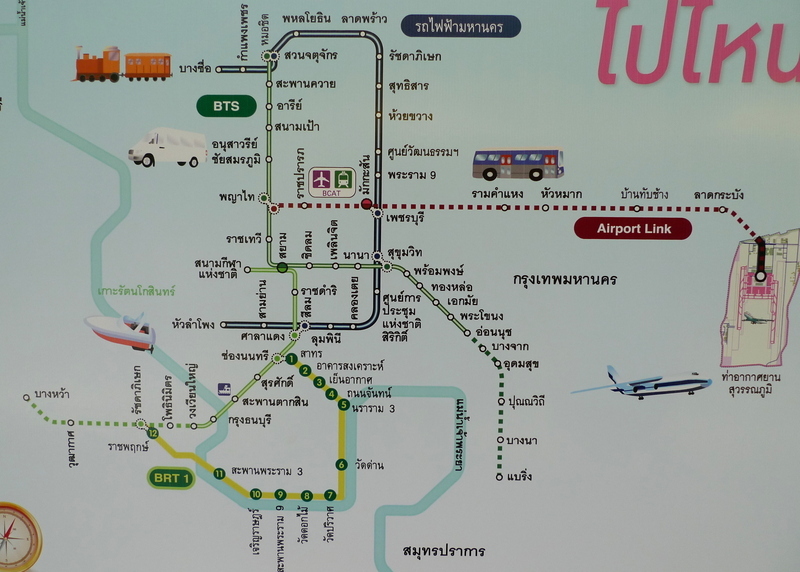 The first map left out one important part of the larger transit scheme here in Bangkok – the Airport Express. The Airport Express (the dotted red line labeled “Airport Link” in the map above) just began trial runs for the public this week and I’ll take a ride next week and report on it, too. As you can see, we are starting to get a more comprehensive transit network in place. If you are really curious, a reader of 2Bangkok.com created a very nice map that shows what our rail transit network would look like if every single proposed line and extension were built. You can find that map here. So let’s get on with a review of the BRT itself. My friend Ken and I, after completing an errand at the US embassy, took the bus down to the Sathorn/Narathiwat intersection. Last October I wrote an entry about the intersection and I’ve pulled some “before” pictures from that entry to contrast with current pictures. This is an artist’s rendering of what the intersection will look like (facing northwest looking up Narathiwat Road towards Sathorn) once the construction is complete. The BRT station is at the bottom and the Chong Nonsi BTS station is at the top. 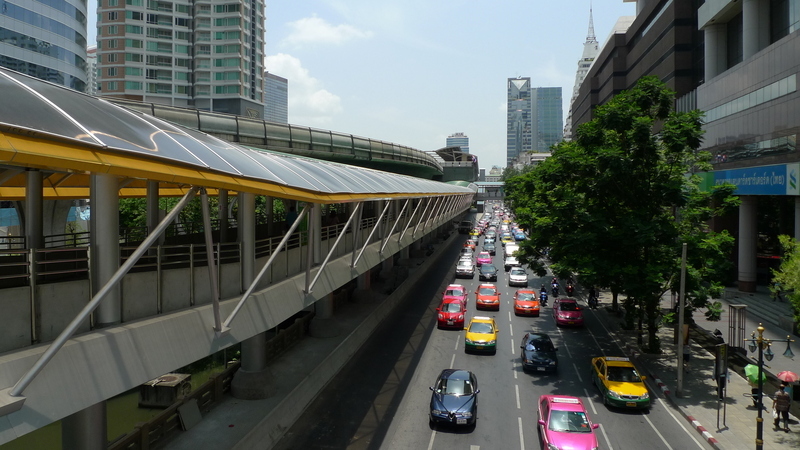 The area with the yellow arch is part of the pedestrian bridge that is being constructed over Sathorn Road, replacing two smaller pedestrian bridges that currently exist at the corners of the intersection. 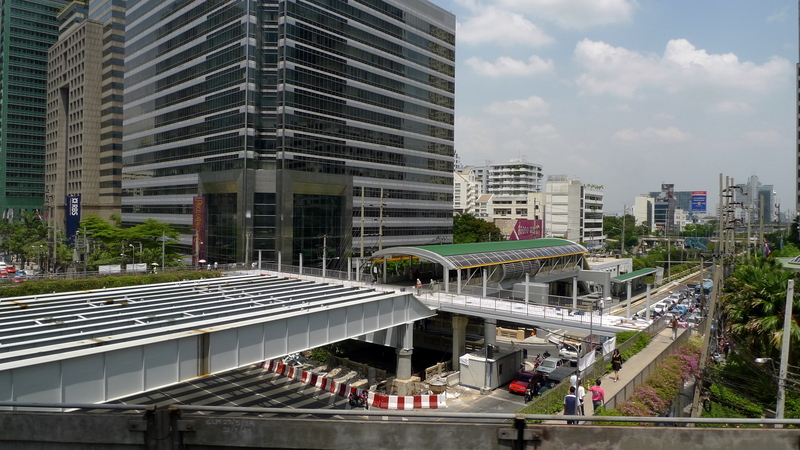 A green-roofed walkway connects from the Chong Nonsi BTS station to the pedestrian bridge. That walkway is pictured below, with the Chong Nonsi station in the distance. Current view of the walkway, above, and the way it looked in October 2009, below. A view from the Skytrain looking southeast towards the BRT station. 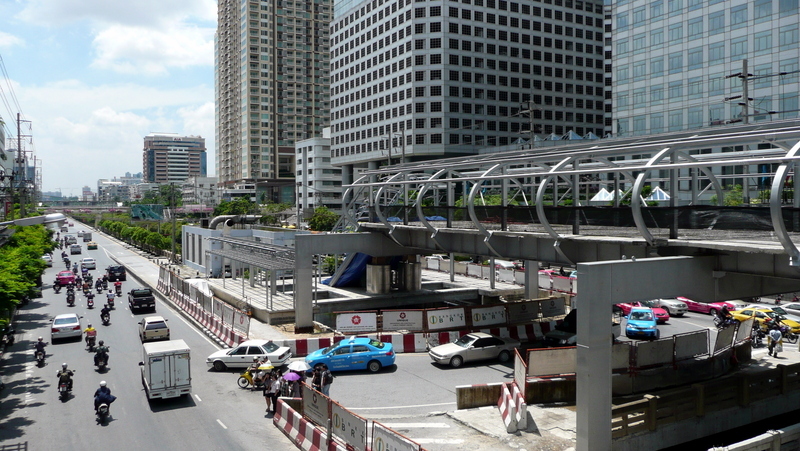 You can see the significant steel works that will form the pedestrian bridge crossing Sathorn Road. This is the area where the yellow arches appear in the artist’s rendering a few pictures above. 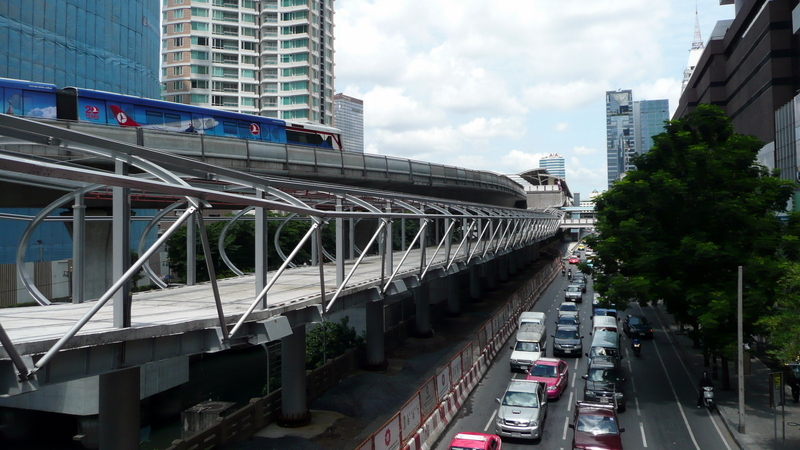 A closer view of the walkway leading from the Sathorn intersection to the BRT station under construction in October 2009. And that same completed walkway now. In the walkway, you pass through a ticketing area (which, I understand, will eventually use the same stored-value fare cards that the Skytrain, subway, and Airport Express will use) and descend escalators to an enclosed waiting room. The waiting room at the Sathorn station has glazed glass and air conditioners, making your wait for the bus more comfortable. Interestingly, the rest of the stations along the line do not have air conditioning, only the two terminal stations. But the other stations are in the middle of the road and, presumably, catch a decent breeze. Busses, which look like Heimlich, the German caterpillar in the animated Pixar film A Bug’s Life, run every ten minutes. The operator’s compartment is separated from the passenger compartment, rather like on a train. The layout of the floor includes bench seating in the front and lots of standing room. Capacity is around 50 passengers. An LCD monitor at the front shows a map of where the bus is on the route, updating in real time, kind of like the “air show” maps on airplanes. Information on the monitor alternates between English and Thai. 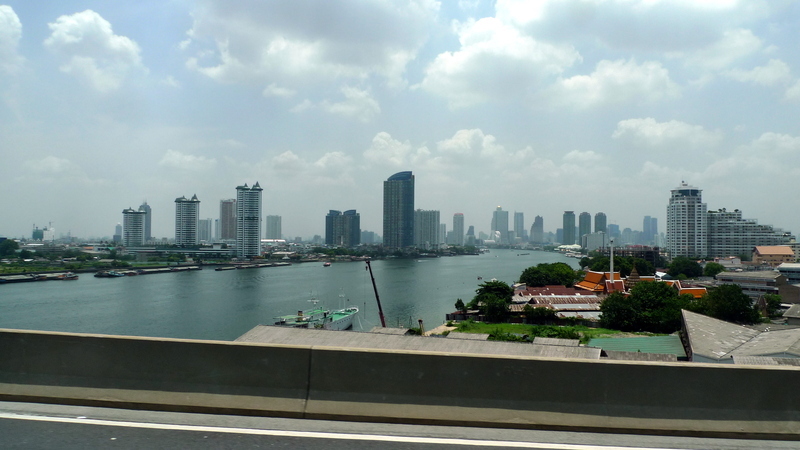 Near the end of the route, the bus crosses the Chao Phraya River on the Rama III Bridge. Above is a view looking northwards towards the heart of the city. You can see that many condos (and a few hotels) have sprung up along the river. Supposedly, there has been a moratorium on further riverside development higher than eight stories, but I don’t know if that is actually true. Off in the distance you can barely make out the gold-domed State Tower, which appears in the pictures from our stay last weekend at the Peninsula Hotel. 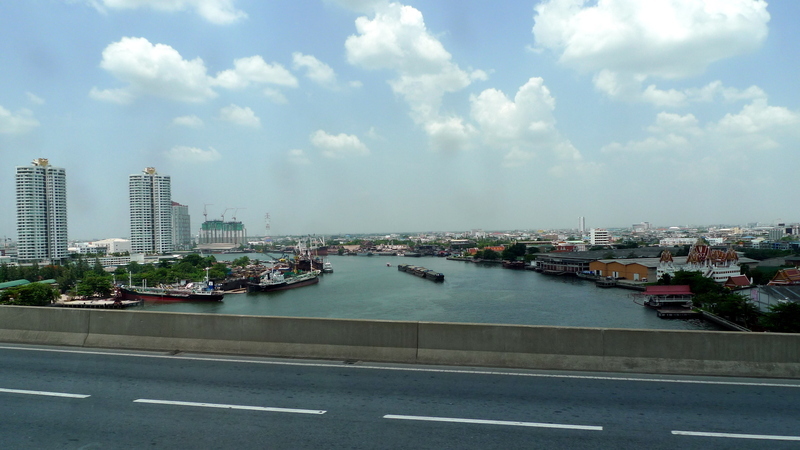 Above is the view from the same bridge looking roughly southwards as the Chao Phraya River prepares to make a large turn to the east. In April 2006, Tawn and I stopped by the temple you see on the right of the picture during Songkhran. There was something like a summer school for young boys, all of whom had their heads shaved and had donned the saffron robes of novice monks. They were playing around – kung fu fighting, it looked like – on the roof of the temple in the heat of the early afternoon. Not very monastic behavior, but it made for a good picture. The rest of the story of that trip to Thonburi is here. Stations along the way are in the median of the road, requiring a climb up stairs or escalators and then across the road on a pedestrian bridge. 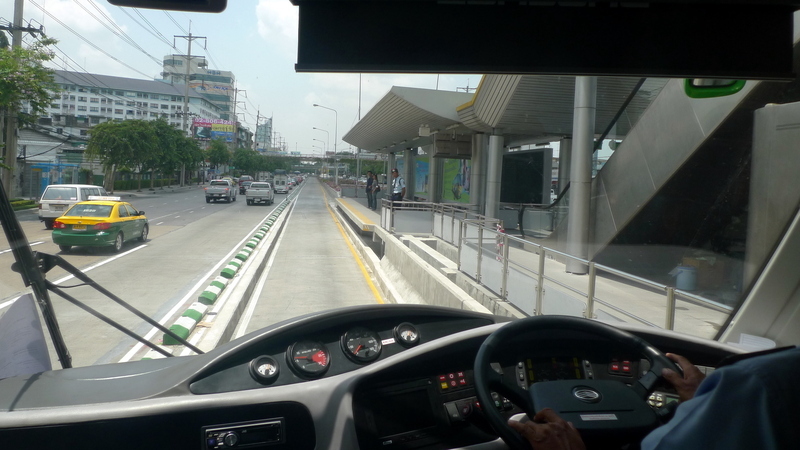 About 70% of the BRT’s route has a dedicated lane for the bus, set off from the rest of the traffic by green and white striped concrete barriers. The remaining 30% is on a section of road with only two lanes, one of which has been painted and signed as being only for BRT busses and vehicles with three or more occupants. Needless to say, traffic on the remaining lane has become even more congested on that section of road, leading to a lot of complaints by car drivers that the BRT is worsening traffic, not improving it. Hopefully, the policemen will actually enforce the law and keep drivers out of the BRT lanes. An interesting feature of the BRT system is that there are additional concrete curbs installed on both sides of the lane at the station. 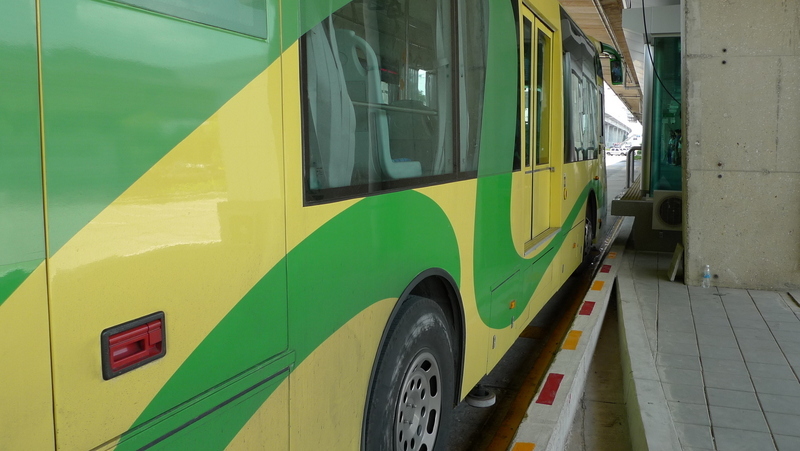 The driver wants to get as close to the platform as possible to make boarding smooth and safe. There are two small wheels sticking out from under the bus, parallel to the ground. These sense the curb and alert the driver so he can properly position himself. All boarding is through the single door in the center of the bus, which is at the same level as the platform. There is one emergency exit (see the red handle?) at the back of the bus. The trip took about thirty minutes one way and provided an interesting look at some corners of the city I don’t see very often. The ride is smooth and comfortable, the stations seem well-located, and the directions and announcements were easy to understand. 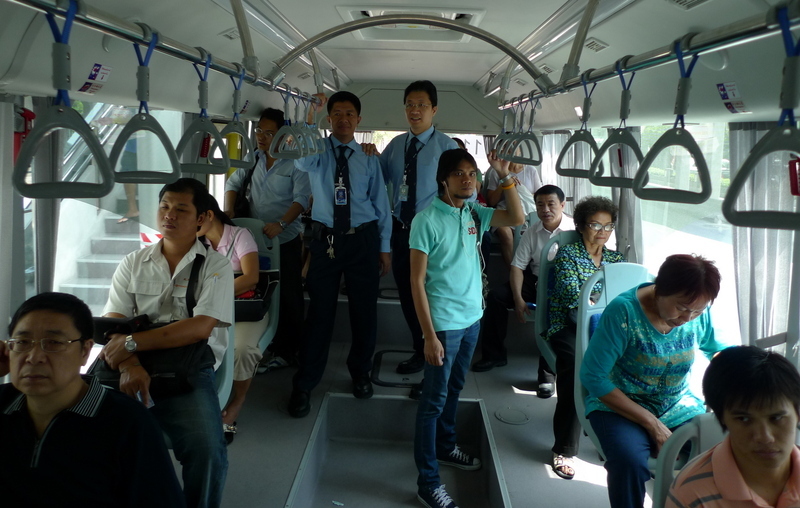 All in all, I have to give a solid B+ to the Bangkok BRT system. If they would bring the same sort of rationalization to the rest of the dozens of bus routes that ply this city, they wouldn’t need to build any more rail. Next week… the Airport Express is finally running. Stay tuned. 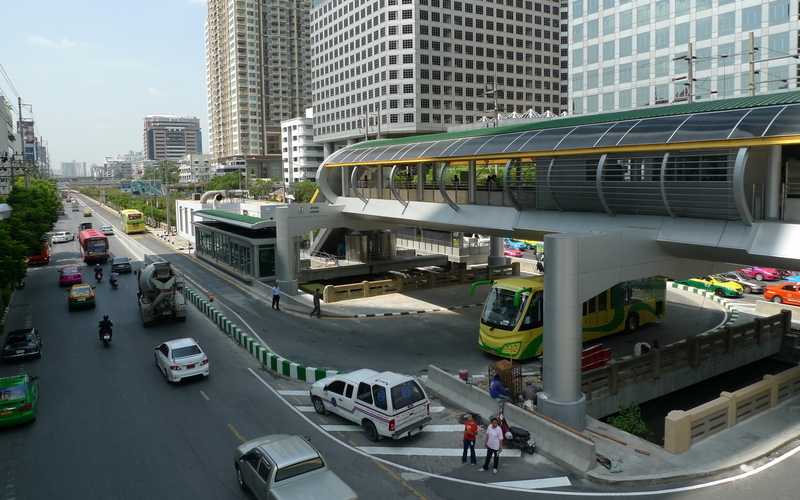 This entry was posted in Uncategorized and tagged Bangkok, BRT, bus, Bus Rapid Transit, Krungthep, Sathorn, Thailand, transit, urban planning by christao408. Bookmark the permalink. Wow that looks nice.But yeah the single seats definitely are a waste of space. It looks really great. I really prefer subway than getting into a car. Although the map doesn’t seem very foreigner friendly, and I think I would be utterly lost since I can’t read it. I love how you compare the buses to Heimlich, the caterpillar 🙂 The DC area has been discussing a light rail or BRT system for some of the suburbs. Ultimately they decided to go with a light rail system. You know, Delhi has a BRT system- a phase of which became operational last year. It is a complete disaster! Did you know that in terms of vehicle volume, the Delhi Metropoltian Area has the largest number of vehicles in the entire world?! Public transportation is a negligible percent of that volume- so when the BRT got introduced it ate into a large portion of the road space severely impacting the already heavy traffic volumes. 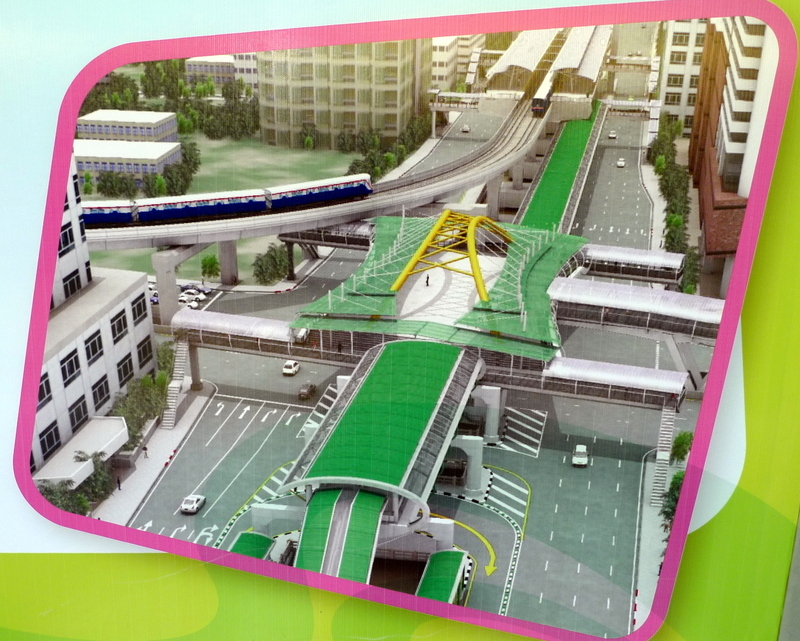 Plus, the whole design has major flaws… so basically, almost every average Delhite hates the BRT system! @Dezinerdreams – Sounds like an example of BRT not done right. There definitely needs to be enough of a network in place so that drivers have a reasonable alternative. I’m curious whether that will prove to be the case here in Bangkok. 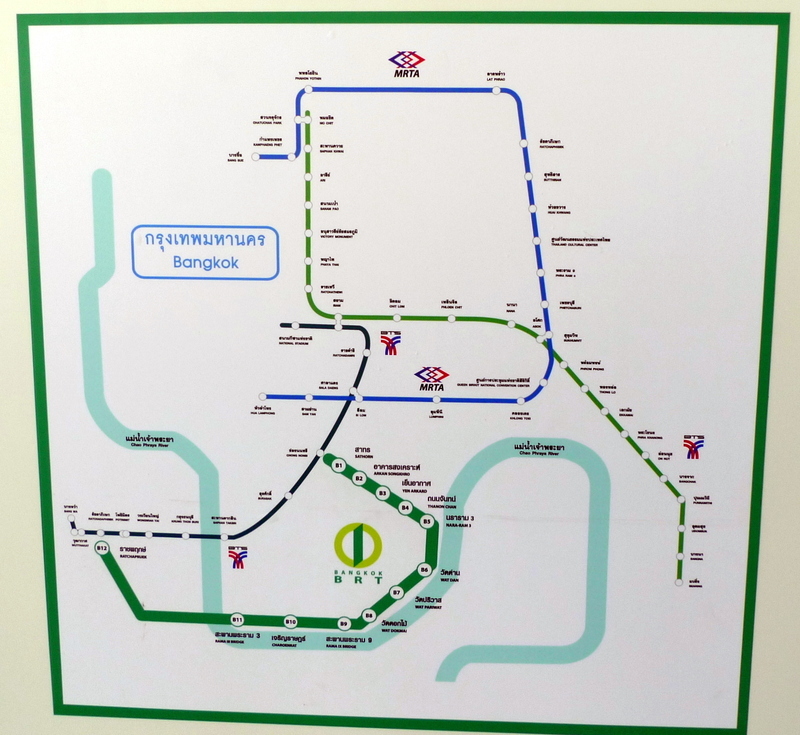 @Wangium – The main maps in the station are both Thai and English. The second one I provided that shows the airport link was on a banner they had posted to announce the new service. I wanted to include it so that you could see a fuller picture of the entire transit network, realizing that it would be hard for everyone to read. @TheCheshireGrins – Interesting – will the light rail in DC connect with the Metro? @yang1815 – Wonder if they will eventually have benches there? It is all pretty amazing – the idea, how it’s coming about, everything…Just wondering… so it’s up and running right now, right? Have many people been using it so far? @Devilzgaysianboi – Yes, it is interesting. I’m an infrastructure geek, though, so I like these things. So far it has been averaging about 10,000 riders a day but they were planning on 30,000 a day during the test phase. It has been plagued with problems according to newspaper reports, although things worked smoothly for me. In particular, the compressed natural gas fuel depot has not been completed yet, so the buses need to be taken quite a distance from the route to fuel them. This has resulted in delays. Sounds like the usual bugs that need to be worked out before the system is performing up to par. @christao408 – Do they have double buses connected in the middle? @christao408 – Yes, the light rail will connect directly into the Metro and be run by WMATA (the organization that for better or worse runs Metro). It’s going to be interesting to see how it plays out. 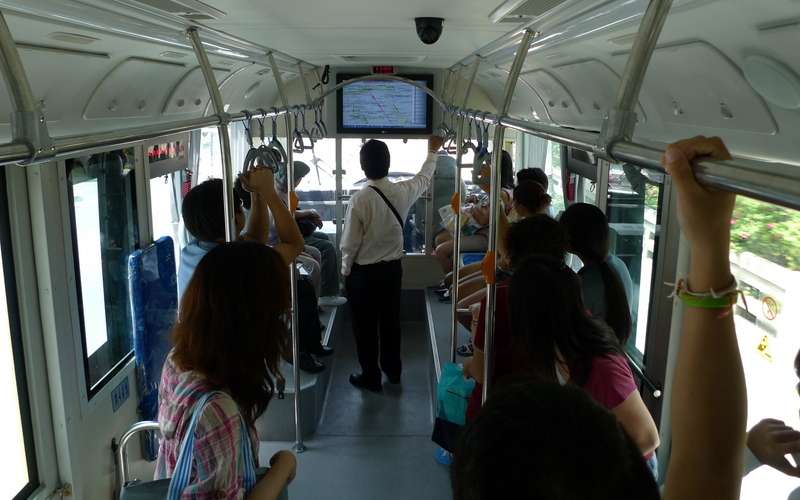 @yang1815 – No articulated buses and I’m not sure the current stations are long enough for them. @TheCheshireGrins – I’ll have to do some research on planned routes. Always curious to see how a system expands. I know Singapore recently added a few light rail (and maybe even a monorail?) routes to supplement their excellent subway network. @lcfu – Yeah, that’s one of the places where BRT has been really effectively used. Several Latin American cities, in fact.